The Garmin ecoRoute hd is a transmitter connected to your car's onboard diagnostics port that sends all sorts of car data to a Garmin nüvi GPS unit to assign a score based on your eco-driving cred. Seriously, it charts your acceleration, braking and speed to determine if you're driving calmly and "green" or, as the rest of us call it, "slowly." The best features of this actually have nothing to do with eco driving, but in the ability to monitor all the other important information in your car and display/reset diagnostic trouble codes. The ecoRoute hd goes on sale this March for a suggested price of $149.99 and will be compatible with most 1000-series nüvi models and future Garmin GPS devices with bluetooth capability. By accessing onboard diagnostics and performance data through ecoRoute hd, drivers can use a compatible Garmin nüvi to wirelessly monitor real-time vehicle diagnostics for most vehicles while accurately calculating ecoRoute data and driver challenge scores (speed, acceleration, braking, etc.). By simply plugging the ecoRoute hd module into the vehicle's standardized onboard diagnostics port (OBD II), safely mounting the transmitter clear of vehicle controls and pedals, and completing the easy one-time pairing with nüvi, drivers can start receiving the vital data from their vehicle and run diagnostic checks through nüvi's intuitive interface before a trip to the auto shop is necessary. Drivers also get more accurate ecoRoute data, making fuel conservation easier than ever, and they can monitor their engine data (including temperature, RPM, emissions) and diagnostics through the Trip Computer screen and customizable Gauges screen. Drivers can then view Diagnostic Trouble Codes – with on-screen descriptions of some error codes – and reset the "check engine" light. ecoRoute hd will be compatible with many current and future nüvi models, including 1260, 1370, 1390, 1490 and 1690. Introduced by Garmin in 2009, ecoRoute is a free software update that helps drivers conserve money and fuel, easing growing pressures on personal budgets and the environment. In addition to "faster time" and "shorter distance" for route preference, ecoRoute lets nüvi users choose "less fuel" as a routing option as the best way to help save gas and money. Through ecoRoute's Fuel Report, Mileage Report and fuel-saving tips, drivers can focus on fuel conservation even when they're not behind the wheel. Fuel Report tracks fuel usage over time, and Mileage Report monitors mileage and fuel usage on a per-trip basis. Drivers can customize their nüvi to fit their vehicle by accessing the "vehicle profile" under ecoRoute in the tools menu. There, you can enter your car's fuel economy and the current price of gas to help nüvi better calculate your savings. To find out if your nüvi is compatible with ecoRoute through a free, downloadable software update, go to www.garmin.com/ecoroute. ecoRoute hd is the latest breakthrough from Garmin, which has spent more than 20 years developing technologies and innovations to enhance users' lives, making Garmin a household name in the automotive, aviation, marine, wireless, outdoor and fitness industries. 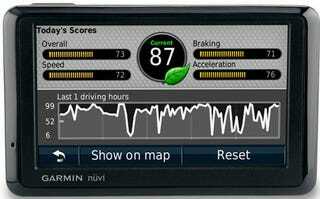 To learn more about ecoRoute and Garmin's other products and services, go to www.garmin.com and www.garmin.blogs.com.